Personal Fact: Wunstel has 23 WSOP Circuit cashes including a WSOP Circuit gold ring, won back in 2010. 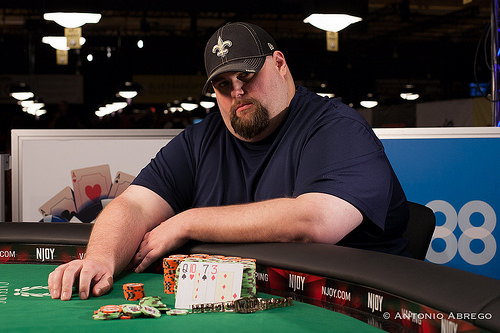 Corrie Wunstel defeated a field of 978 players to win the $1,500 buy-in Pot-Limit Omaha tournament (Event #36) at the 2015 World Series of Poker. He earned first-place prize money of $267,435 and the first gold bracelet of his career as a longtime poker grinder. Wunstel survived a wild final table that had numerous ups and downs. During five-handed play, the tournament hit a lull where the shortest stacks continued to double-up time after time. Five-handed play was grueling for all of the players and lasted nearly three hours long. Eventually Matthew Colvin bowed out in fifth place when he flopped a pair of kings, but ran into Saul's pocket aces in the hole. The pace of the tournament then picked back up with Peter Levine (finishing 4th) and Jim Karambinis (finishing 3rd) following Colvin out the door just a short time later. The heads-up match was then suspended, and was forced into an unscheduled fourth day of action, which was won by Wunstel, who started the final session with nearly a 2 to 1 chip advantage, although he lost his lead at one point and was forced to make a major comeback. Indeed, Saul won a series of key hands which hurt Wunstel, and flip flopped the chip lead. Wunstel seemed to be getting just strong enough cards to be forced into making calls, which were marginally below the strength of Saul’s cards. However, the turning point of the match came when Saul had Wunstel all in and covered with a made straight, only to see Wunstel hit a full house on the river and the board paired. That swung the tournament back in Wunstel’s favor and he won the victory a short time later. The final table did not feature any gold bracelet winners, but did have three WSOP Circuit gold ring winners in Wunstel (1 win), Saul (1 win), and Colvin (2 wins). It was the largest WSOP related financial score for every final table participant, except for Kevin Allen and Kevin Saul. Pot-Limit Omaha has become a game of preference all over the world as a popular alternative to No-Limit Hold’em, and it continues to grow here at the World Series of Poker. Just last week, the $1,000 Pot-Limit Omaha event broke the record for the largest live non-hold'em event ever. The tournament, which was won by Aaron Wallace, drew a staggering 1,293 entries. There are three Pot-Limit Omaha events remaining on the 2015 schedule -- including the $3,000 PLO 6-handed event, the $10,000 PLO Championship, and the highly anticipated $25,000 High Roller PLO event. Second Place: Kevin Saul now has 19 WSOP cashes with his 2nd-place finish. He collected $165,147. Saul won a WSOP Circuit gold ring at Foxwoods a few years ago. His first WSOP cash was back in 2007. Third Place: Jim Karambinis, from Chicago, Illinois. This marks his second cash of the series and third overall. Karambinis recorded his first career cash in 2013, which was also a Pot-Limit Omaha event. He earns the third place money of $103,537 for his third place finish. Fourth Place: Peter Levine, a marketing executive from Woodland Hills, California finished in fourth place. This marks Levine's eighth WSOP cash and is his first final table. This is Levine's first cash in Pot-Limit Omaha, but he has recorded five cashes in Pot-Limit Omaha 8 or Better with the other two cashes coming in No-Limit Hold'em. Fifth Place: Matthew Colvin, from Dallas, Texas finished inf fifth place. He is a two-time WSOP Circuit gold ring winner. This marks Colvin's 27th related WSOP cash, 25 which have come on the Circuit. This cash of $55,479 is his largest and pushes his total WSOP tournament earnings into six figures. Sixth Place: Markus Cara finished in sixth place. Kara is a financial analyst from Toronto, Canada. This is the 27-year-olds second career cash, both coming this year. Seventh Place: Bryce Fox, a 41-year-old from Pittsburgh, PA cashed for the first time at the WSOP. He has one Circuit cash to his name, which also happens to be seventh place finish. Fox is a professional poker who previously worked as a personal trainer. Eighth Place: Kevin Allen, from Romford, England, cashed in 8th place. This is the seventh time Allen has cashed as the WSOP, all which have come the past three years. He finished 222nd in the 2013 Main Event for just over $40,000. Ninth Place: Ke Chao Ni, not only does this mark Ni's first ever WSOP final table, but it is also his first WSOP cash. Ni was born in China and now resides here in the United States. Aside from the final table finishers, other notable players who cashed included – Jonathan Little (25th place), Max Pescatori (45th), Noah Schwartz (54th), Thor Hansen and Tom Schneider (57th). Corrie Wunstel limps from the button, and Kevin Saul checks his option. The flop is , and both players check. The falls on the turn, and Saul checks again. Wunstel bets 265,000, and Saul check-raises all in. Wunstel quickly calls. "Do you have Queen-Ten?" Saul asks. Wunstel nods as he tables for a queen-high straight. Saul turns over for a jack-high straight. The river is the , and Wunstel wins the pot and the tournament. Kevin Saul is eliminated in 2nd place, earning $165,147. Corrie Wunstel is the latest WSOP champion, and winner of the Event #36: $1,500 Pot-Limit Omaha bracelet. He earns $266,874 for his first WSOP victory. No raises preflop and the two players see the dealer fan . Both players check and on the turn card Kevin Saul bets 175,000 and Corrie Wunstel calls. The river is the and Saul bets 275,000. Wunstel calls and Saul says, "Deuce." Wunstel turns over and Saul's stack shrinks to a critical stage. 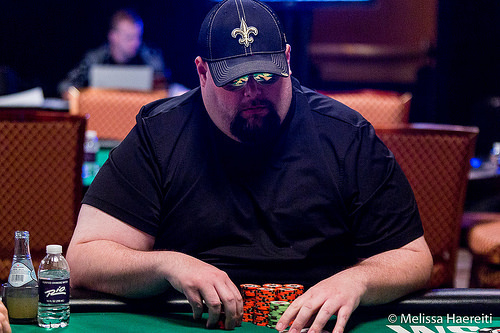 Kevin Saul raises to 360,000 on the button, and Corrie Wunstel calls from the big blind. The flop is , and Wunstel leads for a pot-sized bet of 720,000. Saul raises all in for 975,000, and Wunstel calls. The turn is the , and river is the . Saul doubles up with his pair of tens. Kevin Saul opens on the button for 250,000 and Corrie Wunstel calls. The flop is . Wunstel checks, Saul bets 350,000 and Wunstel check-raises to 1,100,000. Saul thinks about it for some time before calling. The turn is the Wunstel moves all in. Saul quickly calls. Saul has for a straight and Wunstel tables . The river is the pairing the board and giving Wunstel a full house, the double up and the chip lead. Corrie Wunstel limps from the button, and Kevin Saul checks his option. The flop is , and both players check. They check again on the turn, and the river is the . Saul bets 180,000, and Wunstel quickly calls. Saul shows for queens and tens, and Wunstel mucks his hand. Both players are continuing to limp preflop as has been their consistent strategy since getting heads up. Kevin Saul seems to have been getting the better of it so far today as his bets on the flop have meet little resistance as Corrie Wunstel lays it down and Saul accumulates a number of small pots. Corrie Wunstel limps from the button, and Kevin Saul checks his option. The flop comes , and both players check. The falls on the turn, and Kevin Saul leads out for 150,000. The river is the , and Saul bets again, this time for 420,000. Wunstel calls, and Saul turns over for nut straight. Wunstel shows only two cards, the and the for a lower straight. Kevin Saul limps the button and Corrie Wunstel checks. The flop is and Wunstel check-calls a 140,000 bet. The turn is the and this time a bet of 300,000 from Saul is called by Wunstel. The river is the and both players check. After a short delay, cards are in the air and the final day is officially underway. Final Day of $1,500 PLO Begins at 2 p.m.
Today is the fourth and final day of Event #36: $1,500 Pot-Limit Omaha. This tournament was originally scheduled to end yesterday, but deep stacks forced the addition of an extra day. There are two players remaining: Corrie Wunstel and Kevin Saul. Wunstel returns with the chip lead with 4,550,000 to Saul's 2,785,000. Play resumes at Level 31, with blinds at 60,000/120,000. The eventual winner will earn $266,874, while the second-place finisher will walk away with $165,147. Complete results so far can be found in the "Results" tab, above. Cards go in the air at 2 p.m., and play won't conclude until the next WSOP bracelet winner has been determined.